Asa MC NEELY was born on 14 Jan 1810 in , Davidson, Tennessee. He died on 2 Dec 1849 in , Benton, Missouri. Asa married Sarah Rhodes JONES on 13 Dec 1832 in Gallatin, Sumner, Tennessee. Sarah Rhodes JONES [Parents] was born in 1815 in , Sumner, Tennessee. She died in 1887 in , Benton, Missouri. Sarah married Asa MC NEELY on 13 Dec 1832 in Gallatin, Sumner, Tennessee. Sarah Elizabeth "Sally" MC NEELY was born in 1834 in , Davidson, Tennessee. She died in 1853 in , Benton, Missouri. Eliza Anne MC NEELY was born on 28 Nov 1837 in , Davidson, Tennessee. She died on 12 Aug 1917 in , Benton, Missouri. William B. MC NEELY was born in 1840 in , Davidson, Tennessee. He died in 1873 in , Benton, Missouri. Cynthjia Henrietta MC NEELY was born on 4 Jun 1843 in , Benton, Missouri. She died on 18 Oct 1906 in Clinton, Henry, Missouri. Joseph Addison JONES [Parents] was born on 19 Mar 1822 in , Sumner, Tennessee. He died on 6 Aug 1898 in Hartsville, Trousdale, Tennessee. Joseph married Ann Elizabeth ALLAN on 13 Sep 1855 in , Sumner, Tennessee. Ann Elizabeth ALLAN was born on 31 Mar 1832 in , , Kentucky. She died on 5 Feb 1910 in Hartsville, Trousdale, Tennessee. Ann married Joseph Addison JONES on 13 Sep 1855 in , Sumner, Tennessee. Joseph S. JONES was born on 10 Jul 1856 in , Sumner, Tennessee. Lewis Allan JONES was born on 30 Dec 1857 in , Sumner, Tennessee. He died on 9 Oct 1864. Mittie E. JONES was born on 21 Dec 1860 in , Sumner, Tennessee. She died on 10 Feb 1926. Pattie B. JONES was born on 14 Nov 1862 in , Davidson, Tennessee. She died on 27 Oct 1940. George C. JONES was born on 19 Sep 1864 in , Davidson, Tennessee. Zula S. JONES was born on 16 Dec 1866 in , Davidson, Tennessee. Anna Elizabeth JONES was born on 13 Feb 1867 in , Davidson, Tennessee. Vallie L. JONES was born on 7 Jul 1872 in , Davidson, Tennessee. She died on 8 Apr 1938. John F. C. JONES was born on 20 Jun 1874 in , Davidson, Tennessee. Mabel Estel JONES was born on 14 Apr 1877 in , Davidson, Tennessee. Thomas J. JONES "III" [Parents] was born on 22 Jun 1777 in , Albemarle, Virginia. He died on 27 Oct 1825 in , Sumner, Tennessee. Thomas married Judieth JONES in 1791. Judieth JONES [Parents] was born about 1778 in , Buckingham, Virginia. She died about 1819. Judieth married Thomas J. JONES "III" in 1791. Thomas J. JONES "III" [Parents] was born on 22 Jun 1777 in , Albemarle, Virginia. He died on 27 Oct 1825 in , Sumner, Tennessee. Thomas married Agnes Elizabeth WETHERRED on 14 Aug 1832 in , Sumner, Tennessee. Agnes Elizabeth WETHERRED was born on 4 Feb 1803 in , Sumner, Tennessee. She died on 1 Dec 1878. Agnes married Thomas J. JONES "III" on 14 Aug 1832 in , Sumner, Tennessee. Patience JONES was born on 7 Jun 1835 in , Sumner, Tennessee. Margaret JONES was born on 10 Sep 1837 in , Sumner, Tennessee. M iii John Wilson JONES "Sr" was born on 28 Nov 1839. He died on 22 Apr 1880. Mary Frances JONES was born on 9 Mar 1846 in , Sumner, Tennessee. John Wilson JONES "Sr" [Parents] was born on 28 Nov 1839 in , Sumner, Tennessee. He died on 22 Apr 1880. John married Minerva B. WISEMAN on 16 Jun 1877 in , Sumner, Tennessee. Minerva B. WISEMAN [Parents] was born in 1858 in , Sumner, Tennessee. Minerva married John Wilson JONES "Sr" on 16 Jun 1877 in , Sumner, Tennessee. John Wilson JONES "Jr" was born on 28 Sep 1879 in , Sumner, Tennessee. He died on 22 Apr 1880 in , Sumner, Tennessee. Barks JONES was born about 1883 in , Sumner, Tennessee. He died on 29 Sep 1910 in , Sumner, Tennessee. James R. WISEMAN. James married Lucinda WILKS. Lucinda WILKS. Lucinda married James R. WISEMAN. F i Minerva B. WISEMAN was born in 1858. Josias JONES "Sr" [Parents] was born in 1725 in , , Virginia. He died in Nov 1815 in , Buckingham, Virginia. Josias married Mrs. JONES about 1750 in , , Virginia. Mrs. JONES was born about 1730 in , , Virginia. Mrs. married Josias JONES "Sr" about 1750 in , , Virginia. F i Judieth JONES was born about 1778. She died about 1819. Nancy JONES was born in , Buckingham, Virginia. Samuel JONES was born about 1773 in , Campbell, Virginia. Sarah JONES was born about 1776 in , Buckingham, Virginia. Thomas JONES was born about 1776 in , Buckingham, Virginia. He died after 1837. Josias JONES "Jr" was born about 1777 in , Buckingham, Virginia. He died on 19 Dec 1843 in , Buckingham, Virginia. Mary B. JONES was born about 1778 in , Buckingham, Virginia. She died on 1 Nov 1838. Edward JONES was born about 1779 in , Buckingham, Virginia. He died about Oct 1820 in , Buckingham, Virginia. Elizabeth JONES was born about 1784 in , Buckingham, Virginia. She died about Dec 1849 in , Buckingham, Virginia. James JONES was born about 1793 in , Buckingham, Virginia. He died about Dec 1838 in , , Virginia. 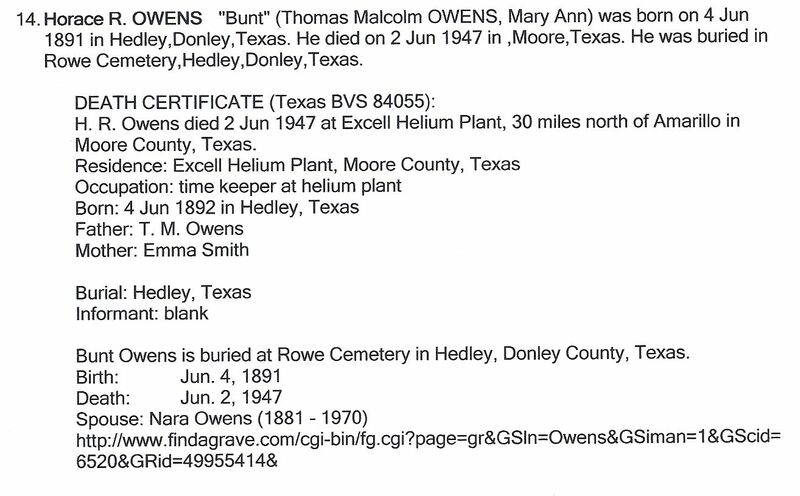 Horace R. "Bunt" OWENS [Parents] was born on 4 Jun 1891 in Hedley, Donley, Texas. He died on 2 Jun 1947 in , Moore, Texas. He was buried in Rowe Cemetery, Hedley, Donley, Texas. Horace married Nara. Nara was born on 8 Mar 1881 in , , Arkansas. She died on 27 Nov 1970. She was buried in Rowe Cemetery, Hedley, Donley, Texas. Nara married Horace R. "Bunt" OWENS. Ada OWENS was born about 1914 in , , Texas. Mark ANTHONY was born in 1690 in Genoa, Genova, Liguria, Italy. He died in 1754. Mark married Isabella HART. Isabella HART was born in 1695 in , , Scotland. She died in 1750. Isabella married Mark ANTHONY. M i Joseph ANTHONY was born on 2 May 1713. He died on 20 Nov 1795. John ANTHONY was born in 1715 in , New Kent, Virginia. He died in Nov 1760 in Evington, Campbell, Virginia. F iii Lucy ANTHONY was born in 1718. She died before 1804. William Lewis INGRAM [Parents] was born on 17 Apr 1943. William married Brenda Marie HAMLIN on 2 Aug 1963 in Covington, Newton, Georgia. Brenda Marie HAMLIN [Parents] was born on 23 May 1945 in Porterdale, Newton, Georgia. Brenda married William Lewis INGRAM on 2 Aug 1963 in Covington, Newton, Georgia. M i Brian Keith INGRAM "Sr" was born on 28 Mar 1965. Tamara Denise INGRAM was born on 23 Oct 1969 in Covington, Newton, Georgia.